Kino Nowe Horyzonty - "The Favorite"
Tough, grotesque, funny and at times hard to look at. A royal court movie without the usual makeup, and when it's there, does not do the job of hiding what is behind the mask. Instead, it rather exaggerates what's going on, as if all the wigs were about to fall off from their heads. For a moment you hold onto the expectation to see a conventional period movie: with shy pale ladies, a game of looks in the corridor, white gloves and some fine cutlery. Well, this is not what you are going to see. The movie revolves around three main female characters: The despair of a Queen (Olivia Colman), the tension between being in or out (Rachel Weisz), and to become someone or remain no one (Emma Stone). The privilege of being under the wing of the Queen, and being the favourite for Rachel Weisz's character, is threatened by the arrival of a new girl in the court, and from there it gets messy: dresses get mud and blood on them in equal measure as their owners fight for favouritism. And then, just when you adapt to the tone, rhythm, and punchy dialogue, you realize that you are watching a comedy, then, it gets dark. The two rivals show different paths toward success. 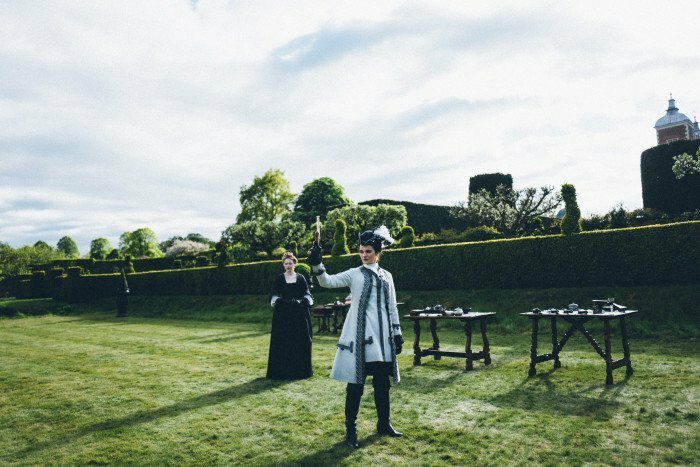 On one hand, the hunger for survival (Emma Stone) and on the other, a stubborn loyalty (Rachel Weisz), all play out in the court of Queen Anne in 18th century England. As it progresses, I had the feeling that the camera stays longer on their faces, their tears, their scars, and we can start to experience the weight of the choices of each character. Somehow it's still a revolutionary experience to see female characters getting rough and fighting their way out. Seems real, refreshing and surprising. Sometimes I felt tempted to look around and see how people were reacting, just to see if they were as surprised as I was.